MOSCOW — With its soaring minarets and golden dome, the huge new mosque that President Vladimir Putin opened in Moscow late last month was welcomed by Muslims as a sign of their greater acceptance in mostly Christian Russia. Days later, some worshippers voiced dismay over the Kremlin’s campaign of air strikes in Syria. “What are we doing there? Let them sort it out themselves,” said Akhmad Bragimov, 79, a Tatar pensioner who was leaving the new main mosque after morning prayers. Russia abruptly began a campaign of air strikes against Assad’s opponents on September 30, dropping bombs from warplanes now deployed in Syria and firing missiles from ships in the Caspian Sea — by far Moscow’s biggest military action outside the former Soviet Union since its collapse. Putin appears to be hoping he can shore up Assad, strengthen Russia’s influence in the Middle East, and challenge U.S. dominance. But he also risks getting bogged down in a costly war and deepening the security challenges Russia faces, including the threat of attacks on Russian soil by Islamist militants. “This could become a second Afghanistan,” said Aidyn Gadzhiyev, 65, a Muscovite originally from predominantly Muslim Daghestan in the North Caucasus, referring to the Soviet Union’s disastrous military campaign from 1979-89. There are no hard statistics on the depth and extent of opposition to air strikes in Syria among Russia’s 15 million mainly Sunni Muslims. Many support the Kremlin in its latest foreign foray, but currents of strong disapproval are also evident – even if not publicly expressed. The reasons for the opposition are manifold, spanning a wide range from simple humanitarian concerns to outright sympathies with Islamic State (IS) militants. Some echo U.S. and European concerns that the Russian bombing campaign is targeting more moderate groups, instead of IS, in order to prop up Assad. “Of course, not all of Russia’s Muslims see Assad as an enemy,” said Ivan Sukhov, a journalist at the Russian daily Kommersantand an expert on the North Caucasus and Islam. “But a fairly large number do, primarily because this is mainly a Sunni community. The Syria situation looks to them like a war against Sunnis by Assad. In this situation, by supporting Assad, Russia has joined the war against Sunnis,” he said. The vast majority of Muslims from Russia and the other former Soviet republics belong to the Sunni branch of Islam — with the exception of Azerbaijanis, who are mainly Shi’a, like Assad’s ally Iran and many in Iraq. Since the start of the air strikes, Putin has been celebrated on Iraqi social media as “Putin the Shi’ite,” according to AFP news agency. 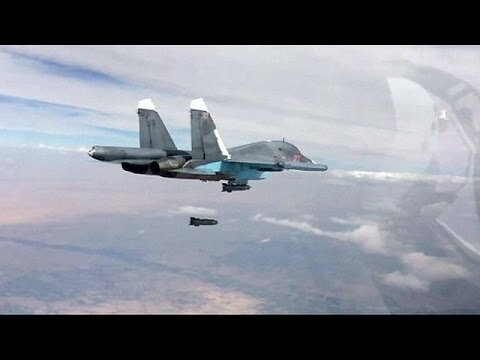 A Russian fighter jet drops a bomb during an air strike in Syria.A Russian fighter jet drops a bomb during an air strike in Syria. Back in Russia, Muslim social networks tell a different story. “It’s enough to look at social networks to see how widely Muslims are not only discussing Russian actions in Syria, but also condemning them,” said Bakhrom Khamroyev, a human rights defender with Memorial, a prominent Moscow-based rights group. Khamroyev said that while many Russian Muslims support the Kremlin’s stated aim of fighting Islamic State, many believe the Kremlin is targeting other militant groups in Syria. The United States and its allies in a coalition that has been conducting air strikes on Islamic State targets in Syria and Iraq from months have sharply criticized the Russian campaign, saying that Moscow is largely targeting positions of rebels not affiliated with the IS group with the aim of strengthening Assad. Washington says only a fraction of Russian strikes have targeted IS. The Kremlin has rejected that criticism on the world stage, but stepping up support for Assad and targeting Sunni Muslims also poses risks at home. In a country where religious faith and feelings have surged since the collapse of the Communist Soviet Union in 1991, Putin has struggled to contain tension between mostly Orthodox Christian ethnic Russians and mostly Muslim minorities from the North Caucasus and other regions, while also calling for unity within the Islamic community itself. The Syria campaign makes those tasks tougher, despite support from mainstream religious leaders who are loyal to the Kremlin. Khamroyev says that Muslim clerics are under pressure to back Moscow’s campaign in Syria. Grigory Shvedov, chief editor of the Kavkazsky Uzel (Caucasian Knot) website, said that in the North Caucasus, perception of the air strikes are mixed: Some are aligned with Kremlin-backed Chechen leader Ramzan Kadyrov, who vocally supports Putin and has offered to send forces under his control to Syria to further the Kremlin cause. But Shvedov said “no fewer” oppose the military action — some for humanitarian reasons, recalling the death and devastation caused by two post-Soviet wars against rebels in Chechnya. Others, he said, sympathize with IS. Aleksei Malashenko, an expert on Islam and the Middle East at the Moscow Carnegie Center, said a growing number of Russian Muslims — particularly young men — have sympathies with IS. Malashenko estimates that “half a million or more” Muslims in Russia share the ideology of Islamic State. Sukhov said that Russia’s Muslims, particularly younger generations, increasingly look to the Middle East for information, culture, and values rather than to Russian media where Russian ideas and propaganda hold sway. The Kremlin’s bombing campaign in Syria has made Russia a desirable terror target for groups like IS and Al-Nusra, according to both Shvedov and Malashenko. Earlier this month, Islamic State’s North Caucasus affiliate, Vilayat al-Kaukaz, called for supporters to join its ranks in Russia to fight against Russian forces, rather than traveling to Syria. There are already signs that authorities are ramping up pressure on Muslims in Moscow, according to Khamroyev. He cited an incident on October 2 at a Muslim prayer room in Moscow’s Ostankino district where he said OMON riot police surrounded the premises and detained several Muslims — some of whom had returned from the hajj — over document problems. He warned that the Kremlin should be wary of cracking down on Muslims in Russia.